A routine check performed by NASA has uncovered two tears on the treads of the Mars Curiosity Rover’s left middle wheel. The damage isn’t unexpected, nor is it catastrophic, but it’s a reminder that this intrepid little explorer won’t last forever. Scientists with the Curiosity mission noticed the small breaks, both of which are on the rover’s raised treads, on March 19. NASA last took a look at the wheels on January 27 and noticed nothing out of the ordinary, so the damage occurred only recently. NASA obviously isn’t happy about it, but insists the wear-and-tear will not change its current science plans or diminish the rover’s opportunities to study key features on Mars. Mission planners got a hint that Curiosity’s wheels were deteriorating faster than expected back in 2013, so they began to drive the rover in reverse as a protective measure. Subsequent tests showed that at the stage where three of the raised treads, called grousers, are broken, a wheel will have attained about 60 percent of its useful lifespan. While frustrating, the damage needs to be put into perspective. To date, Curiosity has traversed nearly 10 miles (16 km) across the rugged Martian surface. Each of the probe’s six aluminum wheels measures 20 inches (50 cm) in diameter, which contact the ground with an outer layer that’s as thin as a dime, except at the thicker treads. 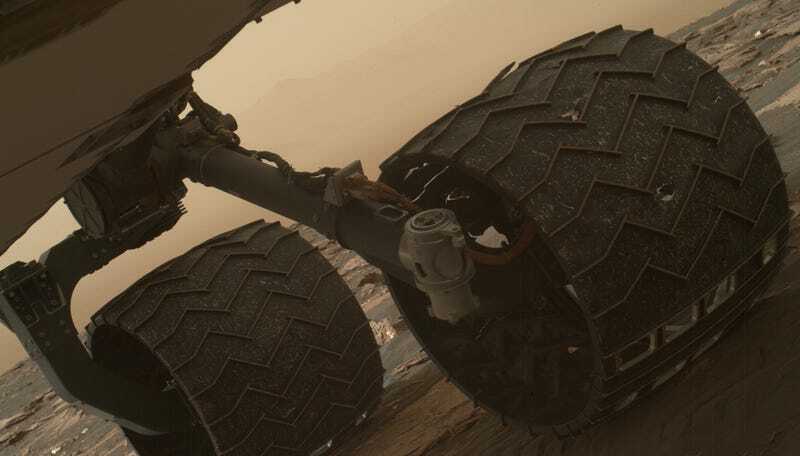 Each wheel is equipped with 19 of these zigzag-shaped grousers, which have to bear the weight of the rover, and provide traction as the wheels traverse over sand and jagged rocks. Curiosity weighs nearly 2,000 pounds on Earth, but since Mars has only about 38 percent of the surface gravity on Earth, it’s about 750 pounds on the Red Planet. Still, a pretty heavy machine. It’s full steam ahead until further notice, but this otherwise freakishly reliable probe is starting to show its age. In early December 2016, NASA was unable to move the rover’s drill bit onto rocks. Engineers suspect that debris, like Martian dirt or pebbles, is gumming up the drill feed motor. The problem, which is thankfully intermittant, has yet to be resolved. Then, on February 24, Curiosity’s arm-mounted Mars Hand Lens Imager (MAHLI) failed to open into its fully extended position. NASA is currently conducting diagnostic tests to figure out what’s going on.